In the eighteenth century the road from Sutton Coldfield to Lichfield was a tortuous and narrow lane, leading up from Mere Green through the village of Hill and on to the common which sloped down towards Staffordshire. The whole route was greatly improved by the Turnpike Trust in the 1820s, including a new stretch of road by-passing Hill Village; this turned Hill Village Road into a quiet backwater, terminating at the edge of the common, and the old road across the common to Watford Gap fell into disuse. It was from this point where the old road terminated that Enclosure Road 32 was laid out in the 1820s “commencing on the north side of the village of Hill in the late old Birmingham and Lichfield Turnpike Road”, and we can see today exactly where this point was because it is where the footpath to Hillwood Common Road is signposted. This footpath was set out by the Enclosure Commissioner, running along the edge of the commons - previously walkers could make their own way across the commons wherever they chose. The footpath starts between 174 Hill Village Road and an apartment block, but in 1826 there was open common on the left and a row of three tumbledown cottages on the right, one of them lying vacant. Hill Village at the time had a high proportion of poor labourers and artisans in its population, including the tenants of two of these three cottages, George Anglesea and Hannah Green. The cottage-style house at 174 was built on newly-enclosed land belonging to the Rector of Sutton c1850, while a gentleman’s residence, Woodfield House, went up on the site of the demolished row of cottages. The wall at the side of the footpath has a curious history. Hugh Lewis, a rich eccentric who moved in to Woodfield House in 1889, had acquired a large quantity of bricks cheaply. 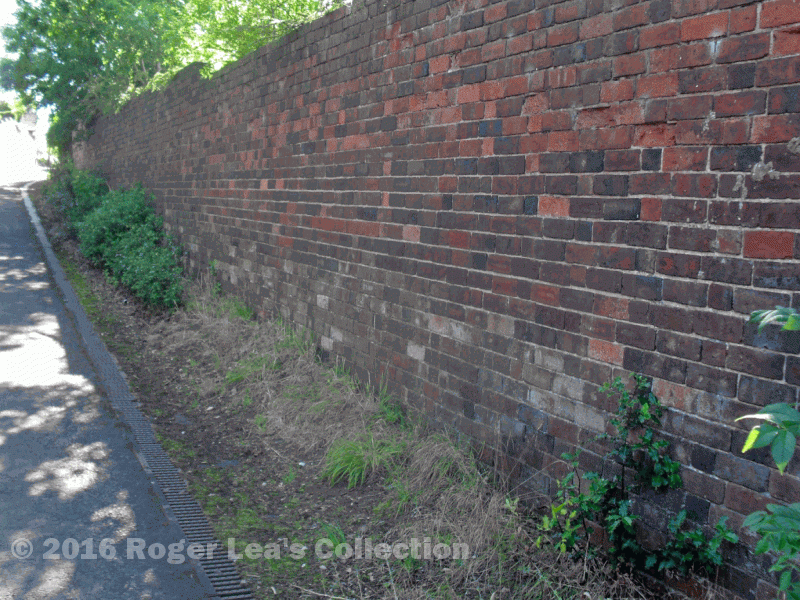 At that time there was a steady trickle of workmen tramping along Lichfield Road hoping to find work and a better life in Birmingham, but rather than give them charity Lewis would offer them a square meal in return for a stint on building the wall. The great height and length of the wall shows that hundreds of men must have taken advantage of this strange offer, painstakingly laying bricks to make a wall which served no purpose. The wall now defines the northern limit of the ancient village of Hill. When the footpath was first laid out it continued in a straight line to reach Hillwood Common Road, but now the eastern end has been diverted along Dunton Close, reaching the road almost opposite the junction with Hillwood Road and Sherifoot Lane..
Woodfield House was demolished over fifty years ago, but the wall remains, said to have been paid for with innumerable hot dinners.